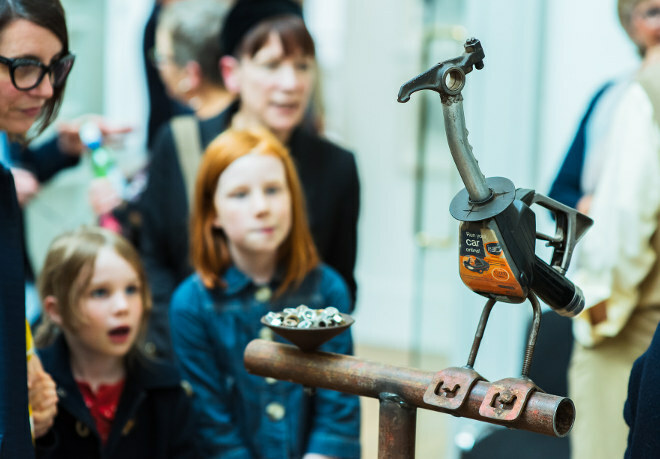 The RWA 164th open exhibition is currently on at the galleries on Queen’s Road, Bristol, populated by strange creatures, wondrous landscapes and portraits with soulfully intriguing expressions. The open exhibition is always a highlight, showcasing a wonderful breadth and variety of artistic talent. Narratives whisper and wriggles on every page, canvas board and plinth. 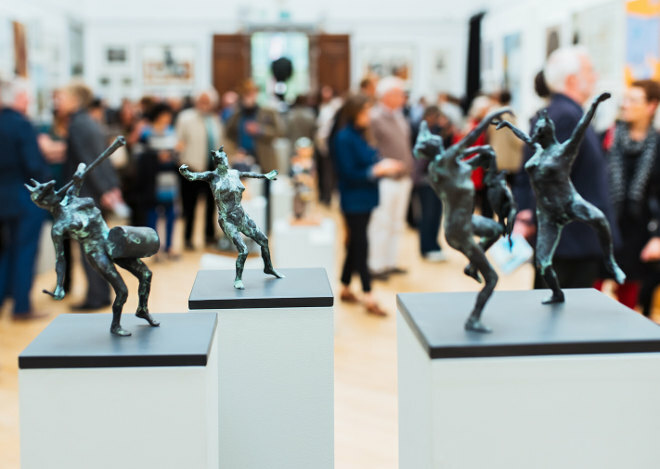 The Maenads Series by invited sculptor Tim Shaw (shown at the top of this post) exudes a wonderfully satisfying sense of joy as they cavort, drum and wave their arms in the air, filling more space than their few inches in height would have you expect. Other works prompt laughter and smiles, such as Simon Tozer’s Mermaid screen print and Fuelling Up by Jason Lanes. Jean Crosse’s A Bowl of Eyes is exactly what its title suggests – a ceramic bowl with eyes on stalks, which led us to remembering old teddies with cataracts and myopia or a single off-centre orb offering the impression of a sly wink. Quieter, meditative artworks take their place on the edges. Self-portrait as Icarus by Richard Twose depicts the artist conducting a flock of pigeons on strings, as though they are marionettes or kites, while the Tabula Rasa (Elsie 1914) by Ruth Wallace gazes steadily back at the viewers, unfazed. Grey Rouge by Rhiannon Davies, is a miniature portrait in watercolour and gouache, well worth crouching down to see. Heart Chakra -> Ego by Yurim Gough looks to me like a new take on her elegant life studies on clay, with a serene face imposed over the model’s own and a perimeter of dreaming figures kneeling at the bowl’s rippled edge. In a trio of paintings by Karen Bowers (Flood and Willow, Sue’s Field, Late Autumn, Late Afternoon and The Natural History Museum’s Wildlife Garden), autumn mists catch in trees and halt us with their atmospheric beauty. These are artworks that present a moment in which to pause, exhale and renew your strength – how fitting for this time of year. 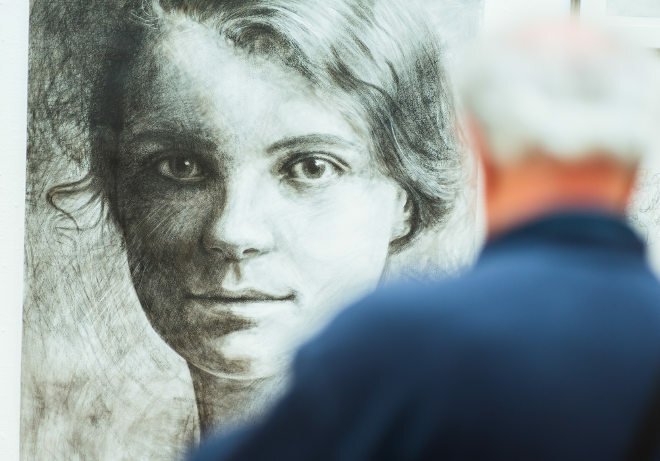 Quite simply, this is an exhibition where humour, contemplation, landscape and memory are offered up in an exceptionally wide-ranging array of works. Escape there for an hour or two, and you’ll inevitably emerge refreshed and inspired. 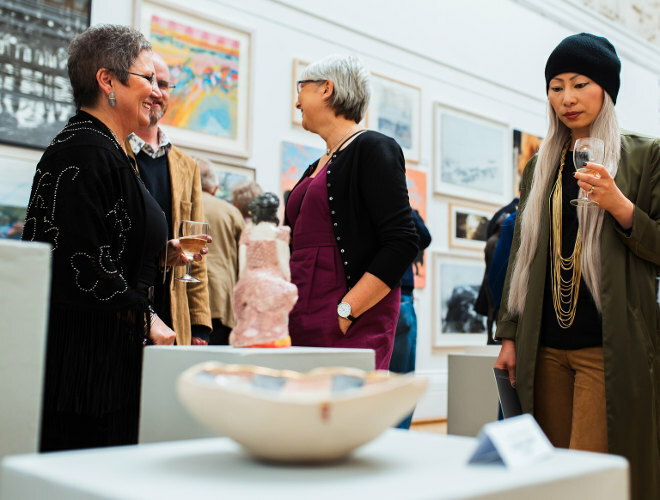 The 164th RWA Annual Open Exhibition is on until 27th November 2016. Find details. All photography in this post is by Jack Offord, provided courtesy the RWA. This entry was posted in Reviews and tagged art exhibitions, RWA Open Exhibition by Judy. Bookmark the permalink.